This post may contain affiliate links.We may earn little commission or products from the companies mentioned in this post. I made a list of profitable investments I can’t wait to put my money into. I thought I should share it with you reading this. You probably have plans for investment but not sure what is good for you and your money. 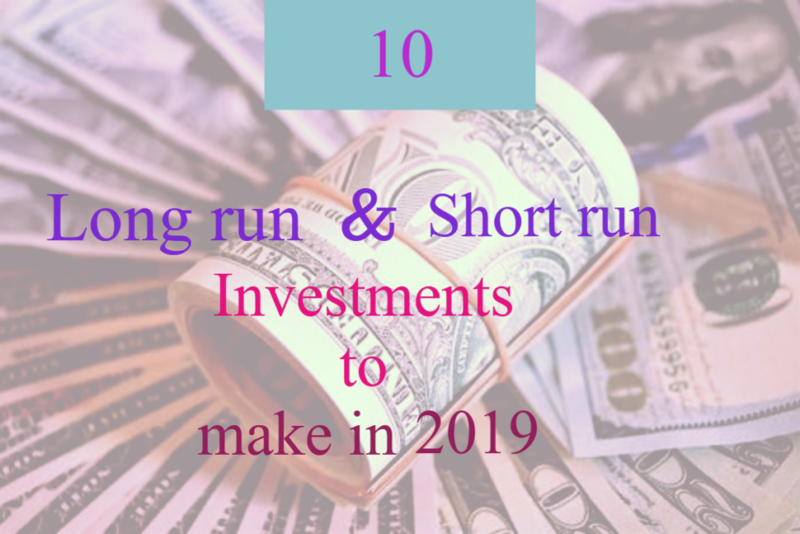 What I love about these investments is they could be for a long run or short run. Also I took my time to research how these products have done on the market over the years . 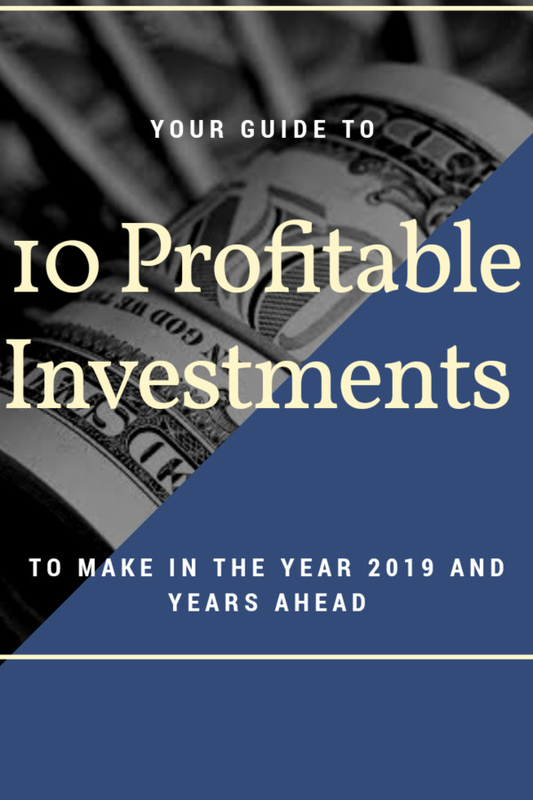 Here is a comprehensive list of 10 profitable investments to make for a short or long run. You are going to learn, why this investments are good, how to go about it and when to go about it. You probably know what investment is all about and how important it is. But if you have no idea what an investment simply means, in my words I define investment as a saving you make, which grows your income. Unlike the traditional saving we know, where you keep your money safe somewhere for future use. With investment, you keep your money safe somewhere but it grows with little or less of your effort. This could be through shares or products which monetary value appreciates as time goes on. Without wasting much of your time, lets go straight to business. I can’t tell you how huge the oil market is but trust me when I say it’s a place to put your money and go to sleep. In case you don’t know this, know it now and here. Many countries are desperate to drill and find oil on their land. If they don’t find it, they invest into it. what about you? what are you still waiting for? or you still need more prove? Daily the five biggest companies of oil and gas in the world makes $375million and $137billion a year in profit. In a day each of this companies make $75million, wow right. Not that surprising after all. All machines run on one form of gas or another including your car. Hence till the day our auto mobiles, start running on water or electricity these companies will continue to make so much money and you can be a part of it. You are not starting a gas company, you just want to make an investment. Don’t rush to whatever company, no mater how good a sector is not all companies survive the long run. Therefore find yourself a company that have stood the test of time and make your investment there. Relax you don’t have to start a farm. However having a farm is not a bad idea. Just like fuel the entire human race consume food at every level. Also all the processed food you eat are gotten from raw farm produce. I will be broad on this one you might have to narrow it down yourself but you will understand how to go about. Every process food was once a crop on a farm or an animal in a farm. For this type of investment it is best if you are the one who is going to own in. It’s like starting your own business. Sounds stressful huh! however nothing good comes easy. But if you want to invest in a farm, have this in mind. 80% of the process food you shop for are crops, mainly grains, fruits and vegetables. We prefer our meat fresh except for the few processed ones like sausages and caned beef or fish. Therefore when you want to invest in farming have in mind what I just mentioned above. This might be another science of its own but it works in hand with agriculture. The potato chips, cheese, ham, baked beans, milk, sugar, flour, butter, soy sauce, ketchup, hot sauce, vinegar, coffee etc. Like I can go on and on of all the things that were plugged from a tree and made into something so amazing we can’t live without. If you want to go into this as an investor then you find a company that sells share and put your money in it. Mind you it’s not just any type. I will help you out on which to choose from. Just take a moment and think dip. What is that processed food you can’t do without. It is currently in your refrigerator? And a quarter or half of your countries population uses it like you do. Probably having it in their refrigerator or it’s on the grocery shopping list for the next day. Finding a product or products shouldn’t take you more than a minute. We all have that one thing that could take us to the grocery store late at night. Invest in a product which it’s demand can sometimes over shadow it’s supply. Meaning the consumption is really high. Every company has how it’s structured not all are investment friendly while some are. Few are new most are old and have stood the test of time. Make a wise pick, sit down and relax. When I say money I mean money. What do you think they do at FOREX? Well in simple words I tell you they buy and sell money and invest in money. There are currency that are strong in global market, it is not a bad idea to have some of those currency. If you happen to be in a country whose currency value is not as high as the dollar, pounds or euros then it will be a wise thing to invest in them. This is how it works; these currencies go high and low sometimes. Buy them when they are low and sell them or exchange them when it is high. That’s how you make a profit from investing in money. Bonds are also another form of investment. You could put your money in it and be glad you did. Gold is something I can’t wait to start investing in. It is pretty simple how to go about it. Like money, the price of gold goes up and down in the market. The moment you read the price have gone down or low go buy a chain, necklace ear rings or a bracelet. With gold you have to be very current. Set your eyes on the stock market section of every news you watch. Another way is keeping in touch with pawn shops. I don’t know how true but people say it becomes more heavy when you use it. So don’t just lock it away wear it. As soon as the price goes up go sell it and you won’t regret buying it. I’ve never heard someone or seen someone regret buying gold. I know my mother loves to invest in gold. You might know it as Real Estate. Whatever name you call it, it’s still the same thing. There is no place in the world where owning a property is not a big deal. However the money you have might not be the amount that could buy you a house or any type of property. Therefore there are many ways to still put your money into housing and estate. There are cooperative societies which all they need is your partnership with others alike. Also you can gradually put money away solely for the purpose of acquiring a property in the nearest future. Entertainment is one of the largest industries in the world. It goes from as low as the Youtube video on the screen of your phone to the movie on the big screens. It’s the memes that makes you laugh on social media and also the comedy late night shows on TV. The big blog buster movies, broad way, low budget movies, soap operas, stand up comedies, reality shows, talk shows e.t.c. The list doesn’t stop here but I hope you understand what I’m trying to say. Entertainment has so many branches and this branches makes a lot of money. I’ve always imagined how amazing it will be to one day be an executive producer of a movie. I know I’ll get there someday. For now I will invest in the ones my money can really be useful. If you get a good and honest broker then you will love stock exchange. This is the first thing i will say about it. Never assume you can do it yourself it might sound easy but trust me it ain’t. However it could be the investment that will change your life around. I could tell you what I know but how about you read for yourself? Here is a detailed content on stock exchange. Sounds vague right? Yes it does. The online world is big itself. You can invest in a lot of things like marketing, influencing, content creation and blogging. For me I decided to invest on a blog and I have no regrets. However the online world operates differently, it needs you to be fully indulge in everything. Like you could pay for someone to maintain your blog or pay for content. You still need to be on the in and out of it all. Also the world online evolves really quickly, learn always and adapt fast. The moment you slag you’d be left far behind. Since I know better about blogging than the rest of the online stuff here are some post to help you out. Do deeper research and see what legal terms and condition are attached to all that I have mentioned above. I am 100% sure investing in all I have listed is profitable. However I don’t know how you might go about it or what company you would choose to invest with. What I know is every industry and company works differently. Be fully enlightened before taking any step. 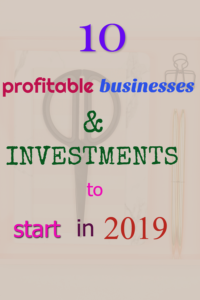 Here you have my list of 10 profitable investments for both long and short run for 2019 and the years beyond.